It's hot out - sure it's like we are in a far flung place, the only thing that is going to drag us back down to earth is the inability of Irish men to dress for the sun. Yes I'm making a massive generalisation but it's OK there is a way to redeem the socks and sandals situation and that is for our beautiful Irish men to smell so divine we forget all about the farmer tan lines and to help us out we have Versace Eros. It has taken 5 years for Eros to be perfected by Donatella and after all Eros is the Greek God of love and you cant be making a mistake on something like the God of Love. She has created a scent that quite frankly is so tasty and delicious I would wear it myself. In fact part of me really wants a female version of this scent (Aphrodite I suppose). The bottle instantly reminds me of a Greek island, it's the colour of the sea and its scent could only be worn by a Greek God or perhaps an Irish one. The bottle is like the translucent waters off Zakynthos with delicate gold detailing although the shape of the bottle is sturdy and simple. Top notes of Mint Oil, Lemon Italy Orpur and Green Apple offer a fresh and delicious opening while middle notes of Tonka Bean, Ambroxan and Gerenium Flower warm up the fragrance. Base notes of Vanilla, Vetyver, Oak Moss Accord and Ceadarwood finish the scent resulting in a fragrance which makes you want to lie your head against the Greek/Irish God's chest and breath in deeply. For me the fragrance is bright and reminiscent of summer but I'm not sure if that's just because Greece reminds me of summer (and the perhaps the friendliest people I have met on my travels). Just in case we we are not hot enough I'll show you Eros in all his glory - enjoy. 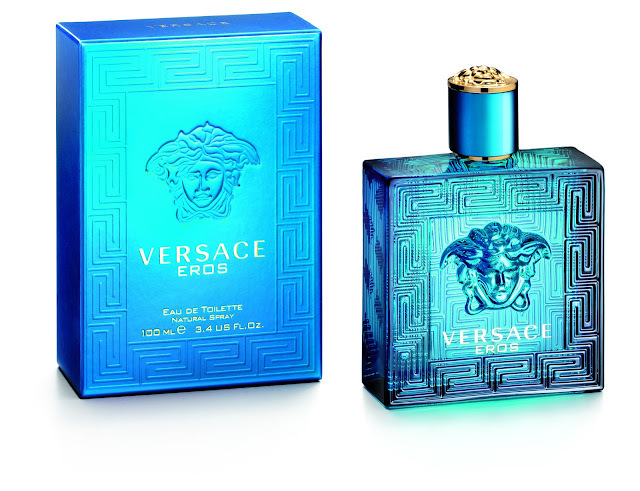 Versace Eros is available now with 30ml costing €45.00 and 100ml costing €79.50 - watch out for gifts with purchase and special offers.